Named the fortress in the sky, this 5th century monument is perhaps the most famous single wonder in Sri Lanka. Sigiriya is popularly referred to as the Lion Rock due to the giant lion paws standing at the entrance to the fortress. King Kassapa gained control of the throne after slaying his own father; King Dhatusena of Anuradhapura. Fearing a retaliatory attack from the rightful heir Moggallana who fled to neighboring India, King Kassapa constructed his royal palace on the summit of this 200 meter high rock with a fortress for his own protection and made Sigiriya the capital of the island. On the summit are the foundations of the Royal Palace, complete with fountains and swimming pools. One of the most stunning features of Sigiriya is the array of rock paintings depicting beautiful maidens which have been well preserved to date. From the summit of the rock fortress where King Kassapa built his palace, it is possible to get a bird’s eye view of the entire region. 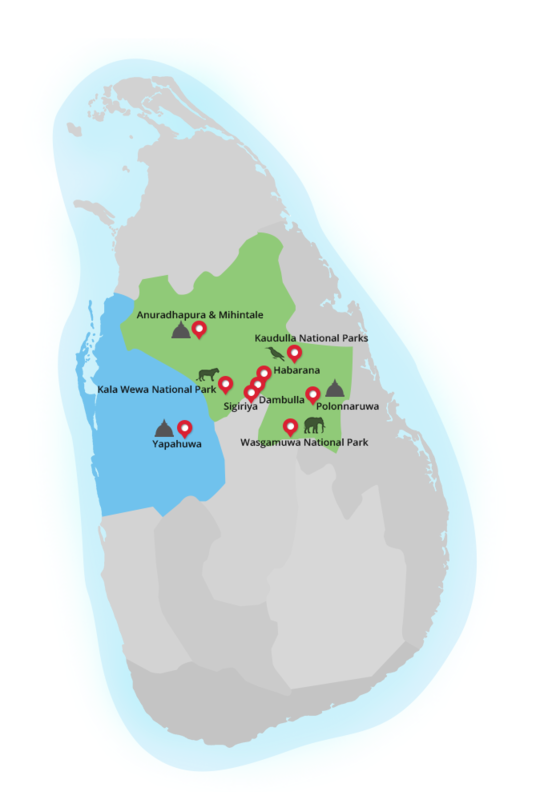 In 495 A.D, Moggallana returned from his exile and defeated the King re-instating Anuradhapura as the capital. Sigiriya was then used as a Buddhist monastery until the 14th century prior to being mysteriously abandoned.